Meooow humans... I’m a seven year old BENGAL lady looking for a new home. Being a Bengal I’m athletic and energetic and need lots of stimulation and space. I’ve been a house cat as I am a little nervous but a safe quiet garden might be nice. I love being made a fuss of by humans but no other pets please And no small children. 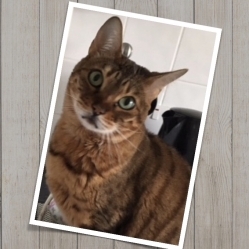 Call Moggy Matchmaker Maria 07719605383 to chat about me and adopting from Willows.